One-Bedroom Crystal Suite with French Balcony 664 square feet. 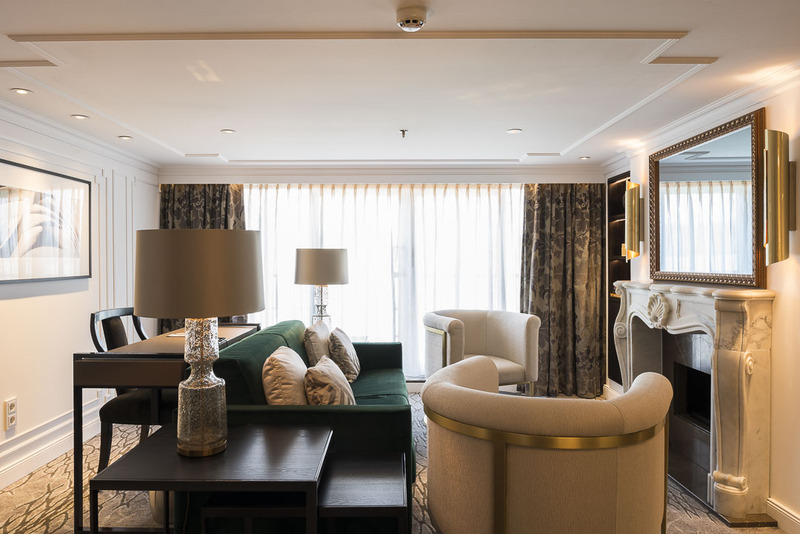 Layered and elegant, with elements of cozy and grand, musical and visual might be the best way to characterize Vienna—or one of many ways, as this imperial city surely can inspire endless lines of poetic descriptions. Once the capital of the Austro-Hungarian Empire and forever known for its distinguished roster of composers who either were born or lived and worked here—including Mozart, Haydn, Beethoven, Schubert, both Strauss’s, Liszt and Brahms—Vienna finds itself at the very center of European culture, even as it sits near the border of the Czech Republic, Slovakia, and Hungary. Turn to a blank page to memorialize your own impressions of this grand city, remarking on its manicured gardens, ornate architecture—especially that of the famed Ring Strasse—intimate bistro pubs called beisln and a certain flourish that can only be called Vienna. Scenic River Cruising at Its Best. 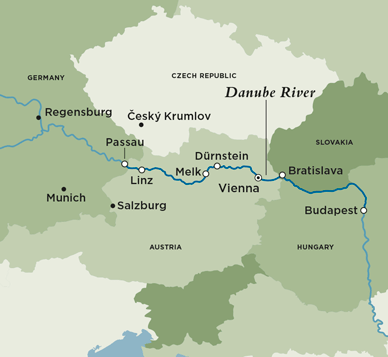 Considered as one of the most visited tourist spots in Wachau Valley, Dürnstein is a robust wine-growing region that sits perfectly alongside the Danube river. Dürnstein Castle, the region’s famous architectural highlight derives its name from “duerr” meaning “dry” and stein meaning “stone”. This landmark sits atop a rocky mountain, high above the damp conditions of the Danube at its base as it overlooks the town. With its picture-perfect scenery, Dürnstein beauty is enhanced by verdant forests, rolling hills, and thriving vineyards that ensconce the town. Take in the sights, sip some of the region’s local wines and simply enjoy a leisurely day in this classic, postcard-worthy European town. Best known for its fortified baroque Benedictine monastery, Melk Abbey, the town of Melk boasts an assortment of smaller gems. Among them, the city’s riverside location, serene and regal with a ribbon of wooded groves giving way to the lovely village. Cobbled lanes and petite size make for a pleasant stroll with a chance to discover its 16th-century Town Hall, or Rathaus, in the center of town, and Haus am Stein or House at the Rock. Built in the 15th century, the vine-covered abode is Melk’s oldest building. At the confluence of the Danube, Inn and Ilz rivers, Passau is also situated at a meeting of cultures. The town began as a Roman settlement, enjoying the rising tide of influence as the largest bishopric in the Holy Roman Empire and enduringly vibrant as a hub for various trade and manufacturing pursuits, including salt, swords, and ideas. Experience Passau’s charm as you wander the cobbled streets of Old Town, gaze upon arched bridges and Italianate manses and encounter magnificent St. Stephen’s Cathedral and the New Bishop’s Residence. Slovakia’s capital city may be the country’s buzzing political and economic center, but it is also a historic gem that stirs the imagination. A maze of narrow, cobblestone streets wind around colorful 18th-century buildings, and shade-covered sidewalk cafes beckon weary—or simply hungry—travelers to linger over a meal and enjoy people watching. Museums, cathedrals, and palaces are edifying locales to spend some time, while photography buffs will want to snap images of the medieval castle that looms over the city with majestic grace. For those looking for more contemporary sights, Bratislava boasts a pulsating modern art scene, as well as some outstanding examples of Communist-era architecture. Cast your eye over the Budapest skyline, and you’ll see all the makings of a world-class city and striking photograph: domes and spires, bridges and lampposts, splendid architecture in the foreground, rolling hills in the back, and the Danube River placidly curving through it, providing a reflective surface for sunsets and city lights. Look closer, and the treasures of Budapest—Hungary’s capital and the largest metropolis—really come to light. Castle Hill is at the top of most visitors’ lists, a UNESCO-listed district hosting Buda Castle, Trinity Square, Matthias Church, and Fishermen’s Bastion. The area is also residential, with 18th-century houses, cobblestone streets and few cars, thanks to a strict vehicular ordinance, giving you a real sense of what the city must have been like ages ago. Budapest is full of history, originally a Roman settlement, formed as a unified city when Buda and Pest joined in 1873, overtaken by various invading forces over the centuries, and today an interesting goulash of local culture and foreign influences. Take a seat in a Turkish-era bath or savor rich Esterházy torte in a genteel coffee house to experience the many sides of a city that charms from both sides of the Danube. The host of the Czech Masters, a European Tour Event. Designed by Keith Preston, and opened in 2009, the golf course occupies an area of more than 80 hectares (197,684 acres) and is situated on a hillside bordering the Cesky Kras Nature Reserve. There are seven lakes on the course covering more than 20,000 square meters, 65 sand traps, and more than 1200 newly planted mature trees adorning the landscape. The leading golf course in the Czech Republic as voted for by Golf Digest, this wonderful resort will start your golfing tour off in perfect style. The host of the Porsche European Open 2015 and 2016, Paul Lawrie Saltire Match Play Championship 2017. Regal golfing pleasure on lush greens and perfect fairways – this championship course, created by former Masters champion Bernhard Langer, seems to be one with the meadow landscape surrounding the small river Rott and was awarded a “world class” rating within one year of opening. The 18 holes in Penning, right beside the Audi Golf Course, do indeed pack a punch. They don’t hold back when it comes to challenges, but also offer sufficient opportunities for some serious success. What makes this golf course so special is the quality of the hand-mown greens and fairways, which remain tip-top even during the summer thanks to a double-row irrigation season. The host of the Austrian Open, a European Tour Event since 2010. This Championship course, host of the Lyoness Open, on the outskirts of Vienna, challenges every player’s ability, thanks to the need for good course management and that important element of water. The 8th hole was designed by the legendary Miguel Angel Jimenez and really emulates the iconic Spaniard. The host of the Slovak Challenge, a European Tour Challenge Tour event. This 18-hole golf course has been built according to plans authored by Nicklaus Design, one of the world’s leading design firms. The Nicklaus Design LEGEND COURSE complies with USGA standards at the world PGA level. 60% of the world’s golf courses which host PGA tournaments have been designed by Nicklaus Design. Along with many other scenic features, this course counts the longest hole in Europe among its challenges. The 787 Yard par 6 15th hole awaits golf enthusiasts, offering 11 tees. The view alone is fascinating. The host of the Hungarian Amateur Championships. The 18-hole golf course of Pannonia Golf & Country Club was designed by the famous Austrian course designer Hans G. Erhardt. The golf course lies in a valley, so the varied forms of its fairways provide a great golf experience. Lakes come into play at 8 holes and pin placements may also present a challenge at the hilly greens. With 6 different tee-boxes, both beginners and advanced players can get a true and fair idea of their golf skills. The natural environment and the beautiful carefully maintained course inspires golf players to hit great shots. Erhardt also designed the Golf course Fontana, host of the Austrian Open for many years and believes that Pannonia is still the best course in Hungary. Vienna optional choice add-on. “A 6th round could be incorporated in Vienna, and I would recommend either Adamstal, ranked 85th in Europe and truly a magnificent course showing the true beauty of the alpine nature around Vienna. (1 Hour drive) or Golf Club Castle Schönborn.” Ask your GolfAhoy reservations agent to reserve either one at time of booking.